Natural Pearls are formed by nature without the hand of man. While living in it's natural habitat, a mollusk such as an oyster, gets a small irritant inside its shell such as a grain of sand, coral or seashell. This foreign body is irritating to the animal so it secrets a mucus to protect against tissue damage (much like a human forms a blister). This mucus hardens and accumulates in many layers, called the nacre, until it becomes larger and larger, becoming one of the most prized objects in the world - a pearl. From this humble beginning, true natural pearls are very rare, consequently considered the most valuable pearls and are not commonly found in the modern jewelry marketplace. In 1893, Kokichi MIKIMOTO conceived a method of duplicating this natural process by inserting a shell fragment into the oyster and stimulating the oyster to grow the thousands of layers of nacre which form a beautiful lustrous pearl. The resulting pearls are referred to as "Cultured pearls." Cultured pearls are formed the same way as natural pearls, but man inserts the irritant (called the nucleus). This process is called "seeding" because a small seed or bead is inserted into the mollusk and the pearl is formed around it. For the best cultured pearls, this bead is made of mollusk shell. The mollusks are raised in a controlled environment, on a farm. The great majority of pearls sold today for jewelry are cultured pearls. The various types of pearls differ in their luster and their mysterious colors depending on the type of oyster that produced them, and they can take on a wide variety of appearances. Akoya pearls are produced by Akoya oysters in Japan. Depending on the size of the oyster, their size may vary between 2-10mm. The range of color of these pearls includes white, cream, pink, green, silver, and gold. Akoya pearls are known for their high luster and rich color. Mikimoto pearls are the most famous Akoya pearls. Frequently called Tahitian pearls, South Sea Pearls are formed by the Pinctada Maxima or "Lipped" oyster. They are farmed in saltwater and grown over a minimum period 2.5 years. Only one pearl is grown per oyster, so these pearls are more expensive and rare than freshwater pearls. They are generally seen in larger sizes, ranging from 8mm and up. Their wide array of colors includes: white, cream, yellow, gold, silver, rose or black. Produced in the South Pacific regions especially in Burma, Indonesia, Thailand, the Philippines, Australia and Tahiti. Tahiti produces especially famous pearls many of which appear in beautiful shades of black and the highly coveted peacock green. Small pearls created as a by-product of the pearl culturing process. If debris enters an oyster while it's open during the harvesting process, the oyster covers the debris with nacre, thus creating keshi pearls. Not an actual pearl, it is the shiny coating that can be seen on the inside of an oyster. All shells that have ability to create a pearl will have the mother of pearl coating present. Created when man attaches a synthetic dome to the inside shell of an oyster, which reacts by covering the dome with nacre. When harvested, the mabe is cut off from the shell, and the inside filled with plastic or other material, to give it more weight. Mother of pearl is sometimes placed on the back of mabe pearls. Grown in mussels or Hyriopsis Cumingi as the host oyster, in the lakes and rivers of China, these pearls are not usually perfectly round. The irritants and oysters used in making freshwater pearls are smaller than saltwater pearls. Freshwater pearl cultivating techniques usually produce twenty or more pearls in one oyster, and it only takes 1.5 years to harvest, so they are generally less expensive than sea-pearls. Luster is the amount of light reflected from the pearl's surface. Luster is the surface glow, as well as the deep mirror-like reflection of the light, or “inner light”. Nacre quality in cultured pearls will improve the overall luster. Many even layers of nacre are required to create a highly defined spectrum of color. Only the highest quality pearls with the best luster carry the MIKIMOTO name. As a product of nature, tiny marks found on pearls are part of their natural texture and are proof of the genuineness of a cultured pearl. These blemishes are produced by outside sea particles and objects that find their way into the oyster and brush against the pearl. A pearl is considered more valuable when the surface imperfections are minimal. There is a wide spectrum of colors that can be found in pearls. Basic colors include cream, gray, green, blue and pink. The most popular colors are white and pink rosé because these shades flatter the widest range of skin tones. Color is based on preference, but it is always important to find a color that is rich and evenly distributed on the pearl. Although many shapes are available, perfectly round pearls are the rarest and most valuable. Button pearls are round on one side and flat on the opposite end. Other shapes like tear drop and baroque are also favored because of their uniqueness. They are formed when an outside entity attaches itself onto the forming pearl and it is covered by nacre layers. Generally, the size of the pearl affects the price. Large pearls are more difficult to cultivate because of the large size of the implanted nucleus. There is an increased likelihood that the oyster will reject the nucleus. Pearls are measured in diameter i ncrements of millimeters (mm). The classic Akoya pearl generally ranges from 3.5mm to 10mm in size. South Sea (White, Golden, or Black) pearl sizes begin at 10mm and can be as large as 18mm. While luster and nacre quality, surface perfection, color, shape and size are standard factors for pearl grading, the MIKIMOTO grading scale is the only qualified system which accurately and consistently defines these six factors by four individual grade categories. No one factor can solely represent the worth of a pearl, but luster and surface perfection are key factors in grading a pearl. 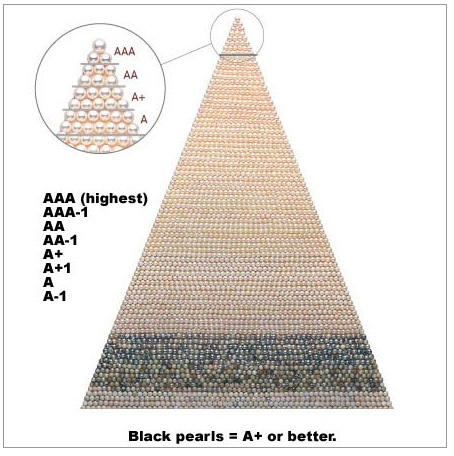 **Black South Sea pearls from Mikimoto do not fall under this grading system but the quality is comparable to A+ or better.